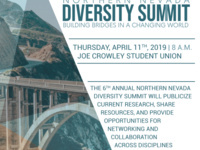 The sixth annual Northern Nevada Diversity Summit titled "Building Bridges in a Changing World." The summit will take place on Thursday, April 11, 2019 at the University of Nevada, Reno campus in the Joe Crowley Student Union and is free for all to attend. The Summit offers attendees the opportunity to discover new programs and opportunities; learn about new ideas and emerging research; and network with campus and community leaders.